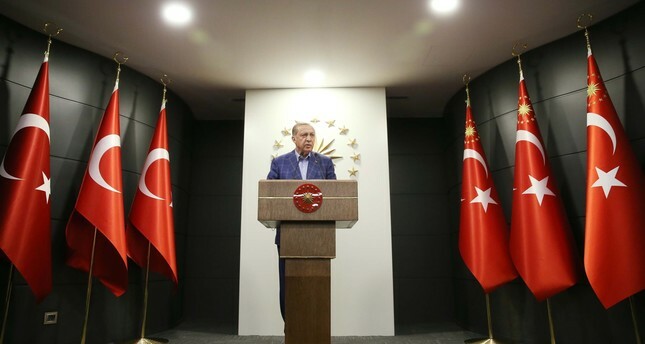 "Today... Turkey has taken a historic decision," Erdoğan told reporters at his official Istanbul residence, the Huber Palace. "That decision was no ordinary one. Today is the day when a change, a decision to shift to a truly serious administrative system was made," he said. "I would like to thank all our citizens, regardless of how they voted, who went to the polling stations to protect their national will." He pointed out that Turkey "has the power to overcome all kinds of problems, difficulties and crises" and the attempted coup last July was the last clear example of it. The 'Yes' win also set the stage for a transformation of the governmental system, a change made through civilian means for the first time in Turkey's history as a republic. "In the past, our constitutions and governmental systems formed by these [constitutions] had been decided either in extraordinary conditions like our independence war or during coup times. For the first time in republic history, Turkey changed its governmental system through civilian means," Erdoğan said. He also said that the new system of government will not be enacted until after the 2019 elections. "All articles of the constitutional change will not go in effect soon. Especially, the changes related to the presidential system will be enacted after Nov. 3, 2019. He also called on other countries to respect the results of the referendum. "We would like other countries and institutions to show respect to the decision of the nation," he said, calling Turkey's allies to now show greater awareness towards Turkey's "sensitivities" in the "fight against terror". As of 9.25 p.m. (1825GMT), unofficial results showed 'Yes' in the lead with 51.34 percent -- 24,789,242 votes -- while 'No' stood at 48.66 percent with 23,499,390 votes. Sunday's referendum asked voters to say 'Yes' or 'No' to an 18-article bill that would see the country switch from a parliamentary to a presidential system, among other changes.